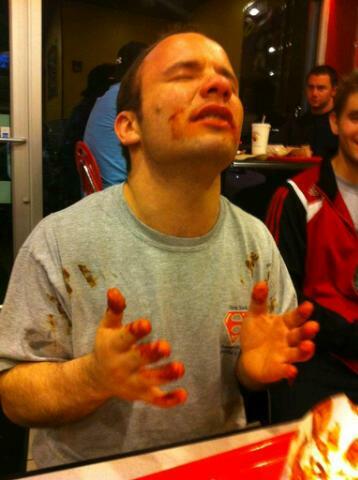 For reasons that are still unclear to me, on Wednesdy night Team NJ member and 56-kilo lifter (and National medalist) Mike Graber took on his most significant opponent yet: consuming ten Buffalo wings covered in Cluck-U’s hideously spicy “911 sauce”, a feat that must be accomplished in under five minutes, followed by five minutes of waiting (no beverages, no napkins, and no puking during this time; rules on defecation during the mandatory wait period are unclear). As anyone who’s ever eaten at Cluck U knows, this is not something to take lightly. Eating normal wings at Cluck-U–or anything from them, for that matter–is an assault on one’s health and well being. The chain’s prime audience–frat boys, drunken college kids, late-20-somethings still clutching to their youth on Saturday evenings–is not known for its gustatory selectivity. When it comes to late-night fast food, this is certainly the dregs, the place you end up after everything else has either closed or kicked you out. But I was willing to endure this culinary wasteland for the chance to watch Mike Graber attempt to conquer the Cluck U 911 Wing Challenge Championship of the World Universe. For some reason, watching people subject themselves to absurdly hot food is always appealing to me. Food challenges of the “quantity” variety–e.g., eating 300 ounces of steak in under an hour, or a fifteen pound burger made with tire-sized buns–is not my thing; it seems so wasteful, so much a slap in the face to the millions of people in our own country who go hungry every day, so representative of one of the uglier sides of American–and really Western–society. But watching someone ingest a normal, or even small, quantity of food that has been made painfully spicy is an entirely different affair; that is real entertainment in my book, and I will gladly watch someone sweat through their clothes in a quest for fiery glory. The event had been planned for about a week (although supposedly had been in the works for far longer), and I was excited from the start. I’d seen these sorts of challenges on TV, but never in person. Anticipation ran high in the days leading up to the Big Event, and there was even a moment of panic when the Challenger pulled out of the competition. But he eventually saw the error in his ways and stepped back into the ring. 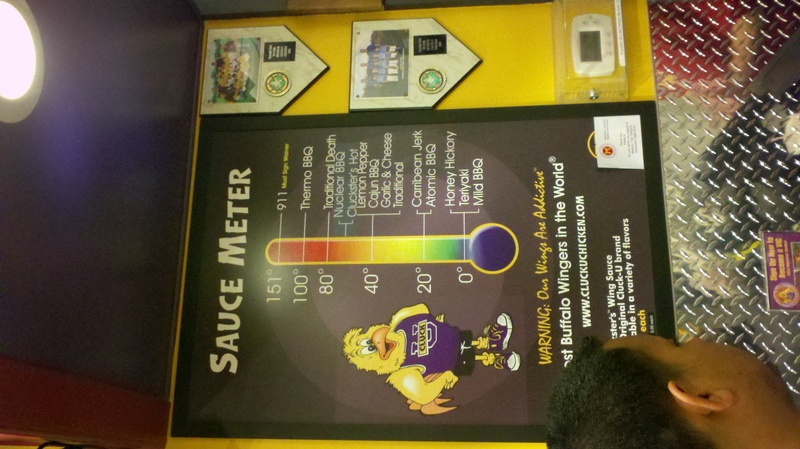 After a training session at FDU to get the blood flowing and work up an appetite we all made our way to Morristown’s Cluck-U, where Graber then called out his opponent–the wings–and signed the waiver required of anyone who orders the 911 sauce. I don’t know what this “waiver” actually consists of, but I expect it carries some weight, since no doubt a company like Cluck-U has a team of lawyers at the ready for inevitable food-poisoning and animal cruelty lawsuits. 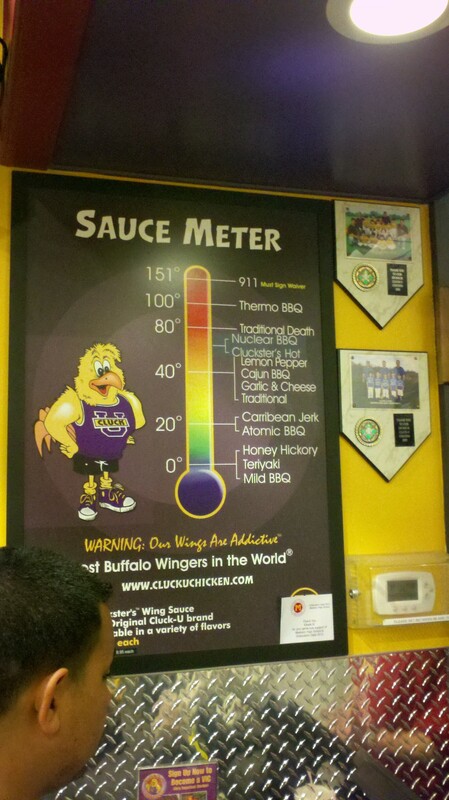 the "hotness scale", which uses random numbers in an effort to scientifically convey the heat of various sauces. also, note the cluck-u mascot (a chicken); anyone else think that's sort of sick? Considering the presence of this waiver I was somewhat concerned for Graber. As much as I enjoy the spectacle of another human being subjecting himself to painfully hot food I certainly didn’t want to watch anyone die while eating spicy chicken wings. Not someone I knew, at least. And certainly not at a Cluck-U. How the hell do you tell someone’s family that their last breaths were taken through bites of fried chicken wings? Any misgivings I might have had were quickly dispelled when Graber dove into his first wing, then another, and then another, all without any apparent ill effects. I don’t know what I was expecting–screams of terror, thrashing in pain, a stroke–but it certainly never occurred to me that it might look this easy. I was beginning to wonder if the wings were even hot when Graber got into wing number five. At this point the effects of the 911 sauce became apparent, as a sheen of sweat broke out on the 56-kilo lifter’s forehead, and tears started streaming down his face. Clearly the wings were starting to take their toll. But the brave little fucker pressed on, hardly missing a beat despite what must have been a goddamn hideous amount of pain and discomfort. Around the seventh wing Graber’s body must have seriously questioned the intelligence of this endeavor, as he began to twitch and shudder. By wing number eight his eyes were completely shut, rivers of tears were making their way down his sauce-stained face, and he was sweating worse than Butch Curry in Shreveport. Yet somehow, through the awful pain and temporary blindness, he put away the final two wings, with plenty of time to spare. Of course the real challenge was yet to come. Getting through the wings is only half the battle, as once you finish the ten little grenades you must sit through five excruciating minutes without eating or drinking anything else, and without wiping anything off with a napkin. (It should go without saying that you must also keep the wings down during this period.) Here is where the 56-kilo men are separated from the 56-kilo boys. As long as you maintain a certain pace while eating the wings you can minimize the pain during that portion of the challenge; the act of chewing and the steady intake of food can distract you from the fact that you’re ingesting the equivalent of deep-fried Drano. But once you finish eating, there’s nothing to distract you–or your frayed nerve endings–from the heat. graber, praying for either a quick death or that his intestines don't leap out of his chest. And yet once again, through some miracle of willpower, Graber made his way to the finish mark. He may have been twitching and shaking the whole time, and he may have looked dangerously close to covering the spectators in a spray of partially chewed wings and hot sauce, but he passed the five-minute mark, proving to us all that when it comes to 56 kilo lifters, Graber clearly stands among the “men”. graber and coach giordano. 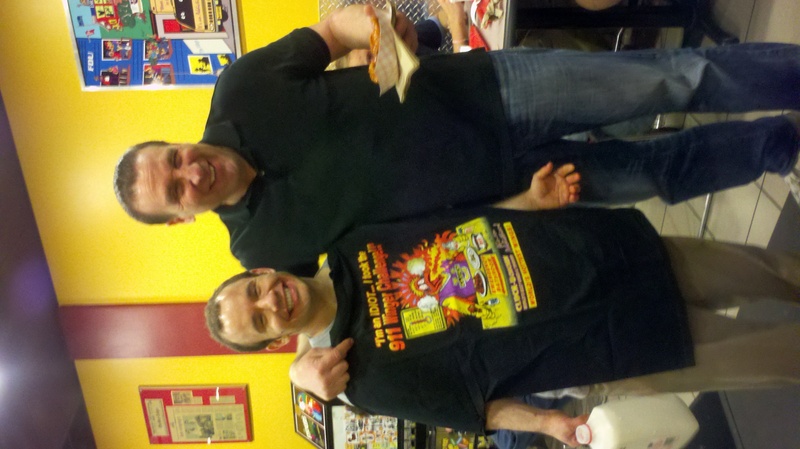 graber is sporting the XXXL t-shirt he received for completing the challenge. Anyone wishing to congratulate him can probably still find him revisiting the wings and milk in the alley by the Cluck-U. This entry was posted in food, Uncategorized and tagged 911 challenge, cluck-u, graber, wings. Bookmark the permalink.